Victoria & Albert Museum: Fifty Masterpieces of Woodwork (London, 1955), no. 25. Highly elaborate chessboards are frequently mentioned in medieval inventories, and in contemporary illuminations ladies v gentlemen are shown engaged in the game. 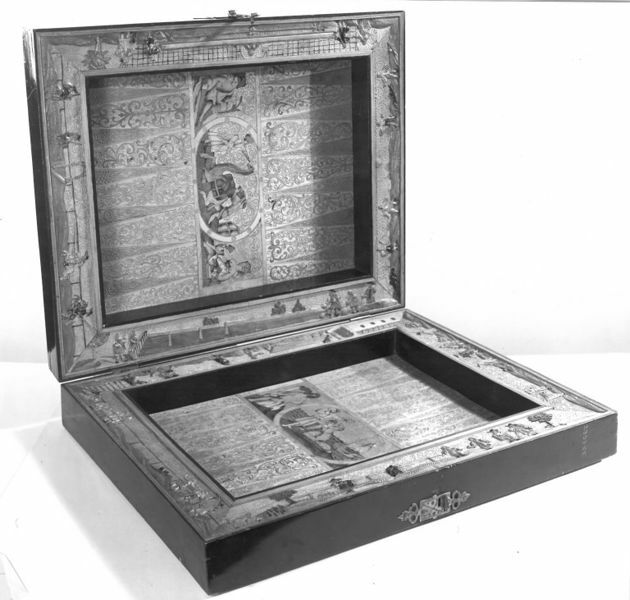 Henry VIII possessed costly ‘bourrles' or ‘pairs of tables’ for the ‘Pleasaunt and Wittie Plaie of the Cheastes'; and in later Renaissance times exquisitely wrought boards of ivory, rock-crystal, and ornamental woods, often decorated with designs or ﬁgured subjects, came into increased vogue among the noble and merchant classes. 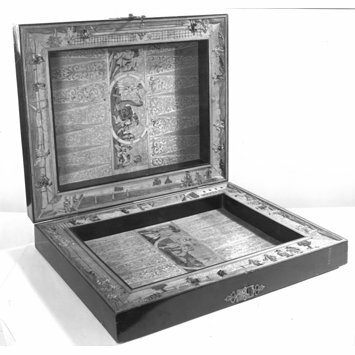 This seventeenth-century games-board, made in England or Holland, is marked on the inside for backgammon and on the outside for merels and fox-and-geese, as well as for chess. The illustrations carved on the inside border show on the left (clockwise) shovel-board, bat-and-ball, kayles(?) and quintain, and on the right bagtelle, knur-and-spell, nine-pins, and tennis. The board is framed in ebonized pearwood and decorated with marquetry of satinwood, boxwood, tulip and other woods. The oriental caravan and shipping scenes, interpreted by European eyes soon after 1600, illustrate the effect on decoration of early trading ventures by the English and Dutch East India Companies. The board, formerly in the Bernal Collection was bought by the Museum in 1855. English or Dutch; early seventeenth century. L. 31 ½ in., W. 19 in. BACKGAMMON and CHESS BOARD. Of various coloured woods with burnt scrolls, the chequers of animals, birds and flowers. The interior ornamented with groups of camels and figures, bordered with carvings in relief, coloured, of men playing at various games, - containing 29 draughtsmen, carved on both sides with animals. English. About 1660. 31.5 in. by 19 in.